FAMILIAR SIGHT: Leeds United's Gaetano Berardi is sent off for the third time this season. Picture by Jonathan Gawthorpe. AFTER seeing Leeds United held to a 1-1 draw at home to the Championship’s second-bottom side Sunderland, Lee Sobot looks at a few key talking points from Saturday’s clash at Elland Road. 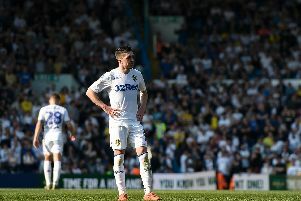 Aside from the moments of magic from Pablo Hernandez, the undoubted main positives of Saturday’s encounter were the displays of youngsters Bailey Peacock-Farrell and Paudie O’Connor with the latter making his Leeds debut at centre-back. Considering this was his first ever game for the club and first in English football, 20-year-old Irishman O’Connor performed with great credit alongside Pontus Jansson at centre-back though the Championship obviously throws up stiffer tests than Sunderland. But on Saturday’s evidence United definitely have a player capable of playing first team football in O’Connor who could well keep his shirt for a few games with Liam Cooper, Matthew Pennington, Conor Shaughnessy and Luke Ayling all injured and now with Gaetano Berardi also banned. Whether O’Connor can truly become a regular starter at centre-back this soon remains to be seen but the signs were certainly encouraging though essentially Leeds need another Kyle Bartley. Peacock-Farrell, meanwhile, is continuing to thrive having been given his shot at the no 1 jersey and this was probably the 21-year-old’s best display in a Leeds shirt yet, strongly advertising his claims to be first choice next season and on this display why not? The custodian produced some wonderful saves and United would have lost the game without his heroics. Again, with Hernandez producing a wonderful finish to draw United level in a game in which most of United’s good moments going forward involved the experienced Spaniard. Talks remain ongoing with Hernandez about signing a new deal with the 32-year-old’s current contract up in the summer. United’s squad clearly needs a major overhaul - the Whites are 13th and 12 points off the play-offs for a reason - but there is plenty of life in Hernandez yet and he is one player Leeds badly need to keep. If not, United’s loss would definitely be someone else’s gain. The less said about Berardi’s flying challenge on Callum McManaman the better with the full back quite rightly shown a straight red for a tackle that was late and high and with both feet off the ground. Berardi has now been sent off three times this season and the defender will be looking at a long ban and probably five games as a result. A five-game ban would mean the 29-year-old’s season is now over and for all that the very popular Berardi’s passion is to be commended, three red cards in one season is clearly not acceptable. His ban will likely mean another chance for under-23s Academy graduate Tom Pearce at left back. Tuesday night’s 2-0 loss at Fulham clearly highlighted the gulf in class between Leeds and one of the division’s main promotion contenders but hopes were cautiously high that United would get back to winning ways against the second worst side in the division based on the table. But Sunderland gave as good as they got and while United had chances to win the game, so too did the Black Cats. It has to be said that Leeds were particularly disappointing in midfield, not for the first time. Surely the fact that major changes are needed is loud and clear and a look at the Championship form table over the last 17 games makes for grim reading. Over that period United have the joint worst record in the division - with their tally of 12 points the same as Burton Albion and one point worse than Sunderland’s.